tpdnews: Arlington man arrested at Haymarket. 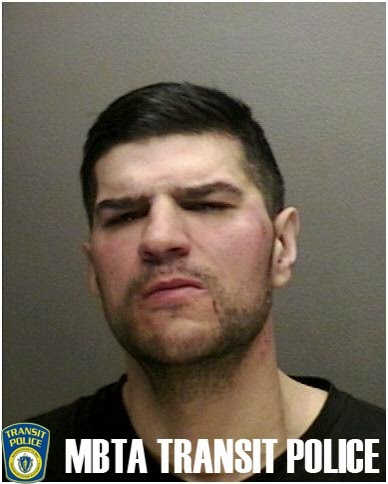 On March 17, 2014 at approximately 8:45 pm Transit Police officers working in Area 1 received a radio call to respond to Haymarket MBTA station for a report of an assault in progress. Upon arrival officers were met by two females who stated the following; while traveling on an Orange Line train the victims were approached by a male, later identified as Richard Botelho, 43 of Arlington, who began to verbally berate them. The victims requested Botelho leave them alone and they moved away to another section of the train. Botelho continued his harassment and then attempted to forcefully grabbed a cell phone one of the victim's was holding onto. As the victim and Botelho struggled for her phone Botelho spat on both victims and swung his fists wildly. At this time the train entered Haymarket Station and a male passenger intervened and subdued Botelho holding him on the platform until Transit Police arrived. Botelho was combative towards the officers as well but was brought under control, placed into custody and transported to Transit Police HQ for the arrest booking process. It is expected Botelho will be arraigned sometime today Boston Municipal Court-Central Division sometime today for Assault to Rob Unarmed and Assault & Battery.